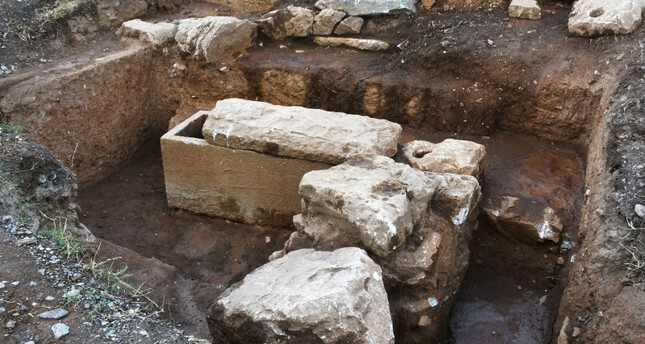 Archaeologists have uncovered and restored seven tombs belonging to Hellenistic and Roman periods in Euromos, an ancient city in southwestern Turkey. At least 25 academics and students from both Turkey and abroad are carrying out excavation work in the coastal town of Milas in Muğla province. The team is led by Abuzer Kızıl, a lecturer at Muğla University. "Euromos is the most important city after Mylasa. These tombs consist of Roman and Hellenistic tiles and sarcophagi," Kızıl told Anadolu Agency. Euromos ancient city, dating back to 5 BC, contains numerous interesting buildings, including the temple of Zeus Lepsinos from the Roman times during the reign of Roman emperor Hadrian between 117 and 138. The temple of Zeus Lespinos, dedicated to the Greek God, stood at the foothill, according to Turkish archaeological news website. Excavations in Euromos were first carried out by Turkish archaeologists in the 70s. However, it has not yet completed.